Draft: 2013, Milwaukee Brewers, 6th rd. Garrett Nicholas Cooper...played first two collegiate seasons at El Camino Community College in Torrance, California, where he was a two-time All-South Coast Conference selection (2010-11)... transferred to Auburn University for junior and senior seasons and was named a Second-Team All-SEC selection as a senior in 2013...is youngest of seven children. Limited to 14 games due to two stints on disabled list for right wrist injuries...Missed 85 games from April 5 (retro to April 2) through July 5 with a contusion after being hit by a pitch; suffered a sprain and returned to DL on July 24, eventually undergoing season-ending surgery to repair a torn tendon sheath...Was 1x7 with an RBI in just four games prior to first injury, suffered April 1 vs. Cubs...Prior to return from first DL stint, hit .300 (9x30) with a double, a home run, and five RBI in nine rehab games with Triple-A New Orleans, and was 2x3 in two rehab games for Single-A Jupiter...Returned from rehab on July 5; recalled from 60-day DL July 6...Went 6x26 (.231) with two runs scored, a double, and an RBI in 10 games for Miami prior to season-ending DL stint. In fifth professional campaign, combined to hit .377 (124x349) with 35 doubles, one triple, 18 home runs and 90 RBI in 90 games between Triple-A Colorado Springs, Double-A Trenton, Triple-A Scranton/Wilkes-Barre and the Yankees. ..Began season with Triple-A Colorado Springs in Milwaukee's system, hitting .366 (102-for-279) with 64 runs, 29 doubles, 17 home runs, 82 RBI and 33 walks. At time of All-Star break, led all Triple-A players in batting average and doubles: ranked second in Pacific Coast League in RBI, OBP (.428) and SLG (.652), was tied for second with 46 extra-base hits and was third in runs scored...Named Sky Sox Player of the Month in each of first three months of season. In April, hit .320 (24x75) with eight doubles, three home runs and 21 RBI in 19 games. In 22 May contests, posted .384 average (33x86) with five doubles, five home runs and 23 RBI. Followed with a .372 average (32x86) in May with 10 doubles, six home runs and 25 RBI...Earned PCL Player of the Week for July 3-9, batting .500 (12x24) with 10 runs scored, six doubles, two home runs and 11 RBI...Went 1x3 with one run scored and one RBI in Triple-A All-Star Game on July 12 at Cheney Stadium in Tacoma, WA...Acquired by Yankees on July 13 in exchange for LHP Tyler Webb...Made Major League debut in July 14 loss at Boston, after having contract selected from Triple-A Scranton/Wilkes-Barre prior to game. Made start at first base and went 0x4. ..In Major League game, collected first Major League hit with fifth-inning double off David Price in second game of July 16 doubleheader at Boston...Went 3x4 with one run scored, two doubles and one RBI in July 17 loss at Minnesota, recording first career run scored and RBI. Marked first career multi-hit game and first three-hit game by a Yankees first baseman since Chris Carter on June 7, 2017 vs. Boston...Had three straight multi-hit games from August 8-10 in Toronto, batting .667 (8x12) with one run, two doubles and four RBI. Became second Yankee in last three seasons to collect eight hits in a three-game series, joining Aaron Hicks, who went 8x16 from May 5-7, 2017 at Cubs. Cooper's eight hits were most by a Yankee in a three-game set against Blue Jays since Ichiro went 9x12 from September 19 (G1)-20, 2012...Was 4x5 with one run, a double and two RBI in Aug. 9 win at Toronto, his 10th career game. Became just second Yankee since 2000 to collect at least four hits in a game within his first 10 Major League games (also Gary Sánchez, 4x5 on Aug. 10, 2016 at Boston in his ninth game)...Placed on 10-day disabled list from Aug. 17-Sept. 9 with left hamstring tendonitis, missing 22 games. Returned from rehab, reinstated from DL and optioned to Scranton/WB on Sept. 9... Overall, hit .326 (14x43) with three runs, five doubles, one triple and six RBI in 13 games (13 starts at 1B) over two stints with Yankees (July 14-31 and Aug. 6-Sept. 9)...Among Yankees to debut in Majors since 1950, his 14 hits through his first 11 career games (July 14-Aug. 10) were tied for most (Yangervis Solarte, 14x39 in 2014)...Following option to Scranton/WB, hit .429 (6x14) with one run, a double and one RBI in four postseason games. 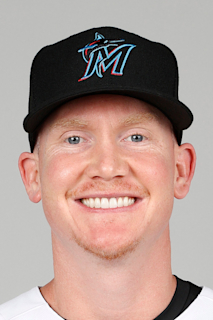 March 31, 2019 Miami Marlins placed LF Garrett Cooper on the 10-day injured list. Left calf strain. October 31, 2018 Miami Marlins activated LF Garrett Cooper from the 60-day disabled list. September 4, 2018 Miami Marlins transferred LF Garrett Cooper from the 10-day disabled list to the 60-day disabled list. Right wrist sprain. August 17, 2018 Miami Marlins sent OF Garrett Cooper on a rehab assignment to Jupiter Hammerheads. July 24, 2018 Miami Marlins placed LF Garrett Cooper on the 10-day disabled list retroactive to July 21, 2018. Right wrist sprain. July 6, 2018 Miami Marlins activated RF Garrett Cooper from the 60-day disabled list. June 20, 2018 Miami Marlins sent OF Garrett Cooper on a rehab assignment to New Orleans Baby Cakes. June 18, 2018 Miami Marlins sent 1B Garrett Cooper on a rehab assignment to Jupiter Hammerheads. April 13, 2018 Miami Marlins transferred RF Garrett Cooper from the 10-day disabled list to the 60-day disabled list. Right wrist contusion. April 5, 2018 Miami Marlins placed OF Garrett Cooper on the 10-day disabled list. Right wrist contusion. October 22, 2017 New York Yankees activated 1B Garrett Cooper. October 3, 2017 New York Yankees reassigned 1B Garrett Cooper to the minor leagues. October 2, 2017 New York Yankees recalled 1B Garrett Cooper from Scranton/Wilkes-Barre RailRiders. September 12, 2017 New York Yankees sent 1B Garrett Cooper on a rehab assignment to Scranton/Wilkes-Barre RailRiders. August 28, 2017 New York Yankees sent 1B Garrett Cooper on a rehab assignment to Trenton Thunder. August 17, 2017 New York Yankees placed 1B Garrett Cooper on the 10-day disabled list. Left hamstring tendinitis. August 6, 2017 New York Yankees recalled 1B Garrett Cooper from Scranton/Wilkes-Barre RailRiders. August 1, 2017 New York Yankees optioned 1B Garrett Cooper to Scranton/Wilkes-Barre RailRiders. July 14, 2017 New York Yankees selected the contract of Garrett Cooper from Scranton/Wilkes-Barre RailRiders. July 13, 2017 1B Garrett Cooper assigned to Scranton/Wilkes-Barre RailRiders. May 21, 2017 Colorado Springs Sky Sox activated 1B Garrett Cooper from the 7-day disabled list. May 15, 2017 Colorado Springs Sky Sox placed 1B Garrett Cooper on the 7-day disabled list retroactive to May 13, 2017. February 24, 2017 1B Garrett Cooper assigned to Milwaukee Brewers. July 26, 2016 1B Garrett Cooper assigned to Colorado Springs Sky Sox from Biloxi Shuckers. March 19, 2016 3B Garrett Cooper assigned to Milwaukee Brewers. August 27, 2015 3B Garrett Cooper assigned to Biloxi Shuckers from Brevard County Manatees. July 18, 2014 3B Garrett Cooper assigned to Brevard County Manatees from AZL Brewers. July 11, 2014 3B Garrett Cooper assigned to AZL Brewers from Wisconsin Timber Rattlers. July 5, 2014 Wisconsin Timber Rattlers placed 1B Garrett Cooper on the 7-day disabled list retroactive to July 3, 2014. June 6, 2014 1B Garrett Cooper assigned to Wisconsin Timber Rattlers from Brevard County Manatees. June 4, 2014 Brevard County Manatees activated 1B Garrett Cooper from the 7-day disabled list. May 25, 2014 Brevard County Manatees placed 1B Garrett Cooper on the 7-day disabled list retroactive to May 22, 2014. March 30, 2014 1B Garrett Cooper assigned to Brevard County Manatees from Wisconsin Timber Rattlers. March 1, 2014 1B Garrett Cooper assigned to Milwaukee Brewers. August 18, 2013 Wisconsin Timber Rattlers activated 1B Garrett Cooper from the 7-day disabled list. August 14, 2013 Wisconsin Timber Rattlers placed 1B Garrett Cooper on the 7-day disabled list retroactive to August 11, 2013. July 13, 2013 1B Garrett Cooper assigned to Wisconsin Timber Rattlers from Helena Brewers. June 18, 2013 Milwaukee Brewers signed 1B Garrett Cooper. June 18, 2013 Garrett Cooper assigned to Helena Brewers.